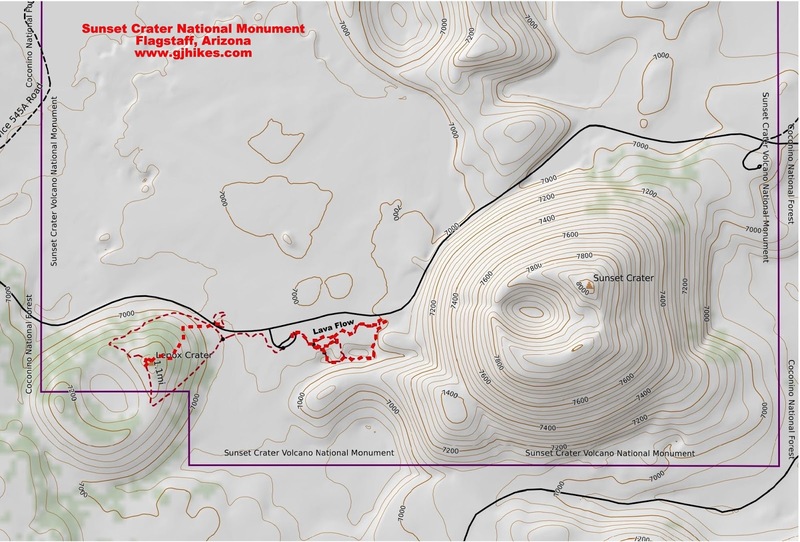 The Lenox Crater trail is located in the Sunset Crater Volcano National Monument near Flagstaff, Arizona. The approximately one mile round trip trail climbs the cinder cone of Lenox Crater where views of the San Francisco Peaks to the west and Sunset Crater to the east make up much of the surrounding views. The volcanic landscape in this area covers over 2200 square miles with over 600 cinder cones dotting the ground. The parking area for Lenox Crater is across the road from the trailhead next to a lava flow. The trail climbs the side of the cinder cone at a consistently steep angle. Wildflowers and ponderosa pines have taken root along the slopes. As yet the cinders haven't been broken down enough to allow much in the way of thick grass to grow. The base of the trail, as well as the entire cone, is nothing but small volcanic cinders. They are easier to walk in than loose sand but still more difficult than packed dirt. The crater is nothing more than a depression where the rims have eroded away over many years. In the background to the west you can see the San Francisco Peaks. At 12,633 feet Mt. Humphreys is the highest point in the state of Arizona. The San Francisco Peaks are what's left of an eroded stratovolcano which is a volcano that is built of composite layers of viscous lava, tephra and pyroclastic flows and characterized by steep sides. Sunset Crater volcano can be seen to the east. Sunset Crater erupted somewhere between 1040 AD and 1100 AD. When you look to the east of Sunset Crater you can see relatively flat ground. It is interesting to contemplate that before that volcano erupted there were Native Indians living here and the area where Sunset Crater is looked like the land to the east of it. What was once probably farm land is now over a billion tons of cinders. The inhabitants are believed to have moved north to Wupatki and south to Walnut Canyon. The loose cinders actually make the hike back down the trail a little easier by absorbing some of the impact of walking downhill. Who would have thought that you would come to Arizona to see the remains of so many volcanoes and a huge lava flow. Sunset Crater Volcano National Monument has a campground where you can stay while visiting the area. The entrance fee that you pay at Sunset is also good at Wupatki National Monument which is a little less than 20 miles further down the road. From the depths of the Grand Canyon to the heights of the San Francisco Peaks this area presents a widely varied place to explore. If you would like to see it for yourself then all you have to do is 'Take a hike'.